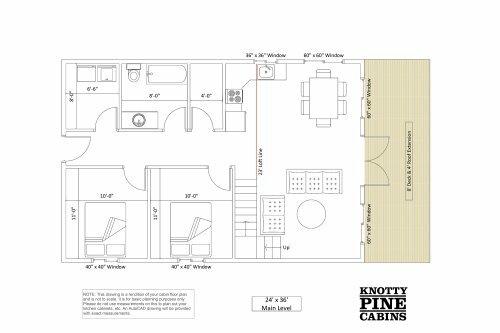 At Knotty Pine Cabins we get a lot of questions regarding floor plans and designs. We find that many of our buyers are very visual and, therefore, they like to view many different examples of plans. Unlike many other home builders and cabin manufacturers, Knotty Pine Cabins allows our customers to customize and design their very own floor plan. Some clients prefer to look at sample designs and change a room or two and maybe move some windows and doors around, while others come to us with their very own custom floor plan in mind. Many customers are also unaware that we can make larger custom home packages from what they see in our catalogue. We have currently designed some beautiful 30’x40′ wood home packages for clients who are looking for more space to live in year-round. Don’t forget the bunk houses! We also design many small bunk house cabins that are smaller than our 12’x12′ catalogue package. One of the most popular sizes is 10’x10′ which is perfect for sleeping quarters. For our smaller cabin packages, we have a design web page that we call the “Knotty Pine Cabin Creator” Please go to www.mondocanuck.com/KnottyPineCabinCreator2/ to design any cabin in our 12′ wide series. We would like to have this system for our larger cabin packages in the near future. Whether it be a custom wood home or a small customized guest cottage, Knotty Pine Cabins can work with any design to build the cabin you have always dreamed of! For more questions on our packages, please contact us at 1 877 854 2224. As more and more of our clients are living in our cabins year-round, we are starting to see a rise in designing custom kitchen packages. Customers no longer want little kitchenettes that are suitable for weekend cabin living, they want beautiful and functional kitchens that coincide with the beautiful pine interiors of our wood homes. Now that you have an idea on design and colour, Knotty Pine Cabins can set you up with one of our cabinet specialists to create a rendition drawing of your kitchen. Our helpful team can also assist you in choosing everything from counter tops to drawer pulls all which will come together to create the look, design and overall feel you wish to achieve for your dream kitchen. Remember to have some fun when designing your kitchen! Express yourself. By the time, you have finished with our creative team; you will have a cooking space that will make your guests say wow! For more information on our prefabricated cabin packages, please contact us at 1 877 854 2224.